Pros: An easy to follow comedy, thanks to its smooth execution and attentive direction. Cons: Some of the final scenes are less immediate than the rest. A breath-taking visual journey across a war-torn Europe: exhilarating yet thought-provoking. 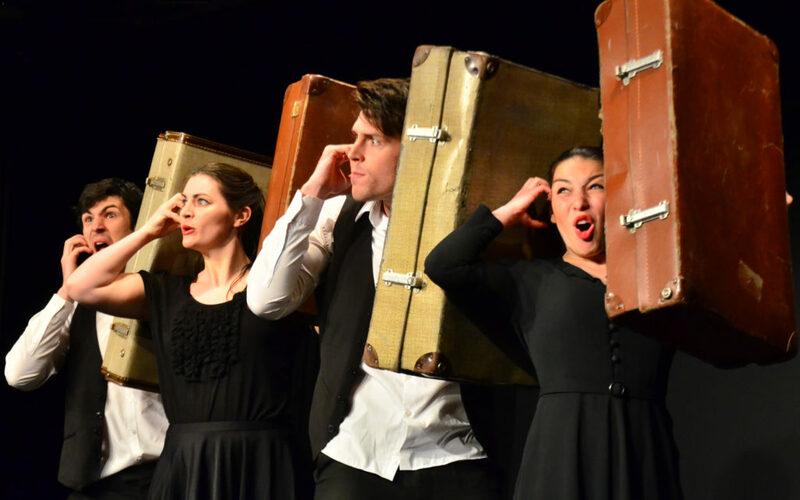 As a part of the Camden Fringe Festival, Buckle Up Theatre is at the Tristan Bates to present Journeys, a physical comedy which has already toured in Lithuania, Belgium and Germany. Journeys is a mosaic of personal incidents that lead two men and two women to catch the same train across a war-torn Europe. Pierre (Rob Taylor-Hastings) is an unsatisfied French painter whose genuine artistic style is contemned by his clients. Conchita (Rosie Ward) is a daring Spanish housewife who meddles with illegal and dangerous activities to cure her disabled child. Marco (Andrew Hollingworth) is an unlucky Italian soldier constantly overshadowed by his brother’s achievements and therefore despised by his family. Lola (Genevieve Dunne) is an English femme fatale who makes a living of her bawdy business but is ready to commit murder for love. Their shared itinerary is bumpy and adventurous but it will eventually lead them towards a placid and promising end. The 70-seat plain black studio is an excellent choice for a performance that requires maximum concentration on the physicality of the actors. The only background is a beige canvas where some pictures are occasionally projected and the props are equally minimal: four fold-up wooden chairs and four card-board suitcases. What the ensemble manages to do with these objects is a completely different story. The chairs become windows, easels, trench parapets, weapons and beds, meanwhile the suitcases mutate into all sorts of surfaces and storage facilities, like tables, canvases, car-boots and even wheels. The costumes are simple and benefit from the odd addition of accessories like glasses, hats, aprons and scarves, whilst their retro vibe recalls the 40’s wartime. Thanks to some well-coordinated and flawlessly executed choreographies, everything floats overhead, makes noise and moves around the space, before magically falling into place and reappearing with a different function. The stage setup changes continuously as the attention switches between characters, whilst lighting and sound play an essential role in giving shape to every sequence. The rhythm is tight and the four actors put sweat and tears into this powerful show. Their bodies are plastic and their expressions studied down to the smallest element. With impressive dexterity they tell everything whilst barely using the spoken word. They’re whimsical, funny and absolutely gorgeous to watch. Deviser and director Michael Woodwood has overseen Journeys throughout its creation, all the way to the excellent finished product. My impression is that, under his watchful eye, this piece has been polished into a superb composition of music, dance, mime, projections and physical theatre. The outcome is mesmerising and, whilst watching it, I didn’t dare blink for fear of missing a dazzling detail. My only concern is that such an elaborate performance might depend upon a certain proximity to the audience but, whilst this could be an issue in a larger theatre, also means that it would work very well on screen, where the camera could capture every detail. 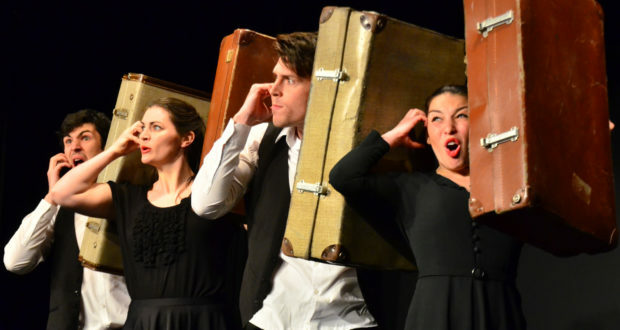 If you don’t have a chance to catch the show at the Tristan Bates Theatre, fear not, Journeys will be at the Edinburgh Festival Fringe until the end of August. As for me, in the future I will definitely look out for Buckle Up Theatre and I’m already excited about their original take on Shakespeare’s Macbeth, coming up in September at the Redbridge Drama Centre. Booking Until: 6 August 2016 then at the Edinburgh Fringe until 29 August 2016.